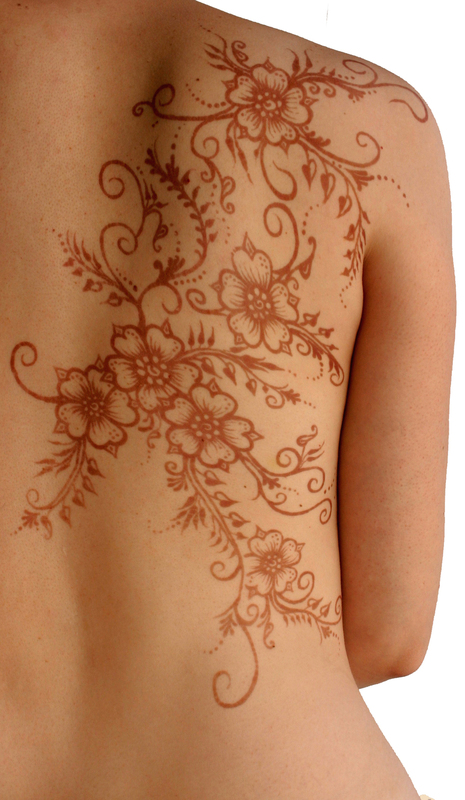 Henna is a natural plant based dye that is applied to the skin as a paste in intricate patterns. Our lovely traditional and contemporary designs are applied by hand, giving you a one of a kind piece of art. Using only natural red-brown henna, simple, safe ingredients, and traditional methods of application; getting your henna will be an exotic experience. Your henna design will give you a beautiful stain for approximately two weeks, and will fade naturally as your skin exfoliates. 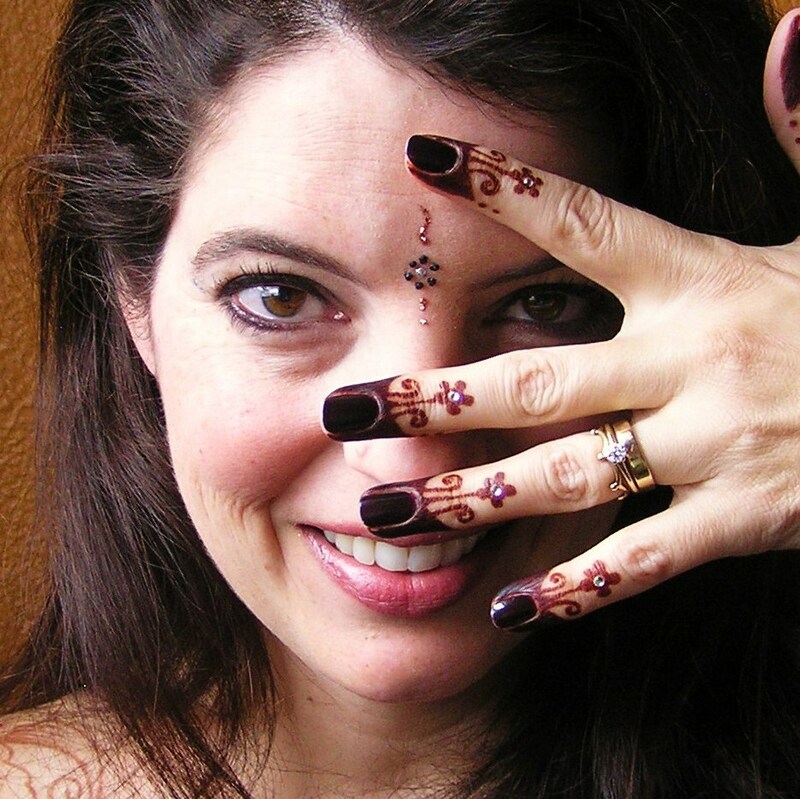 We are proficient in any style of henna you’d like: Moroccan, Indian, Gulf, Contemporary. 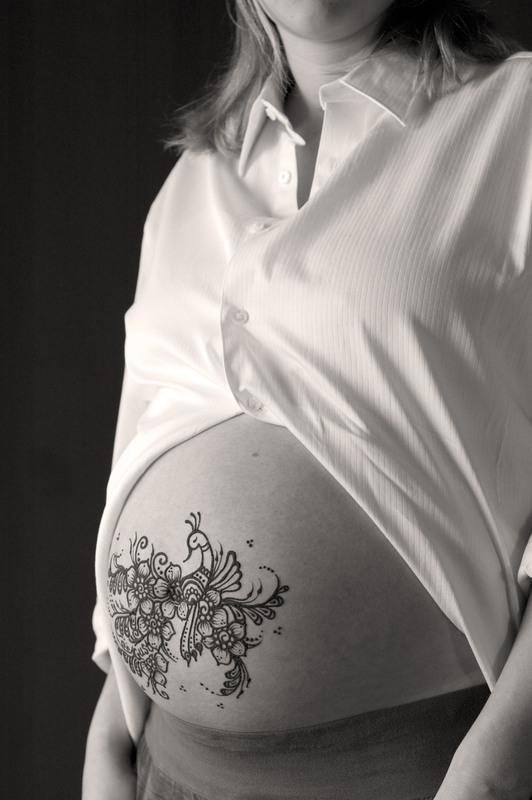 We love Maternity Henna, Bridal Henna, and Event Henna as well as private appointments. Pictures on this page where the design appears black have the henna paste on, the pictures where the red-brown stain is showing are paste-off pictures and THAT is how your design will look. 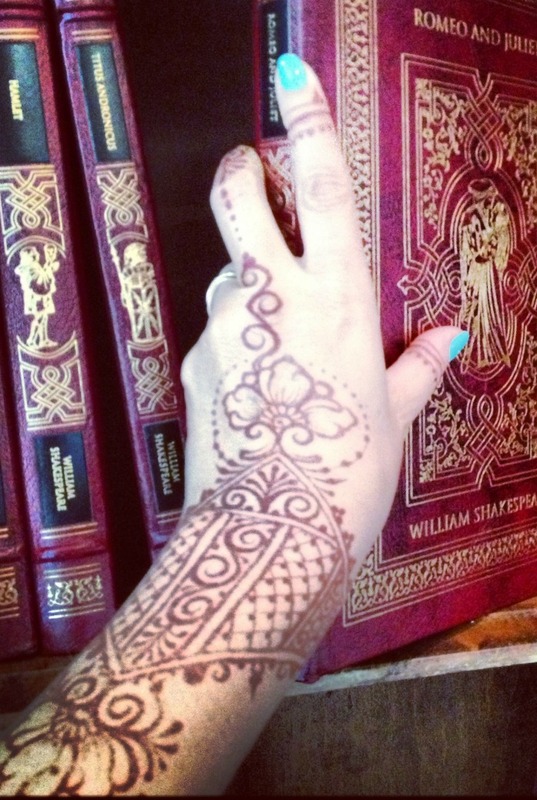 Henna only comes in one color, a beautiful warm reddish/brown. There is no such thing as “Black Henna”, only chemicals used in place of henna, and it’s often PPD para-phenylenediamine, which can cause scarring, blistering, and severe allergic reactions that can leave one sensitive to many chemicals for life. To learn more about the dangers of PPD click here. 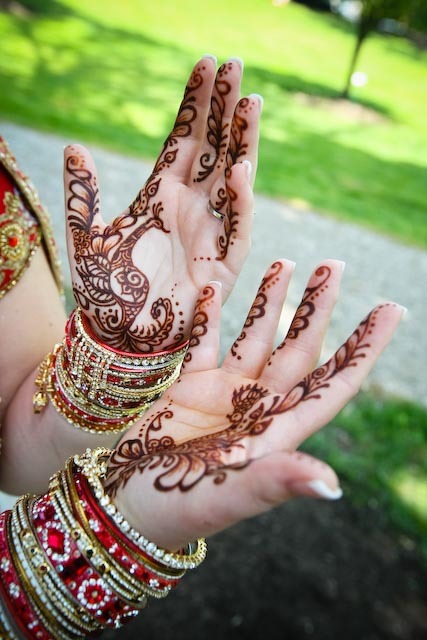 Pre-Care: Before your henna appointment you will want to make sure that you are clean and free from lotions and oils. Because the henna paste needs to sit on the skin for many hours undisturbed, it's best if you've already eaten and used the restroom before you get your henna so that the chances of smudging or knocking the paste off prematurely is lessened. 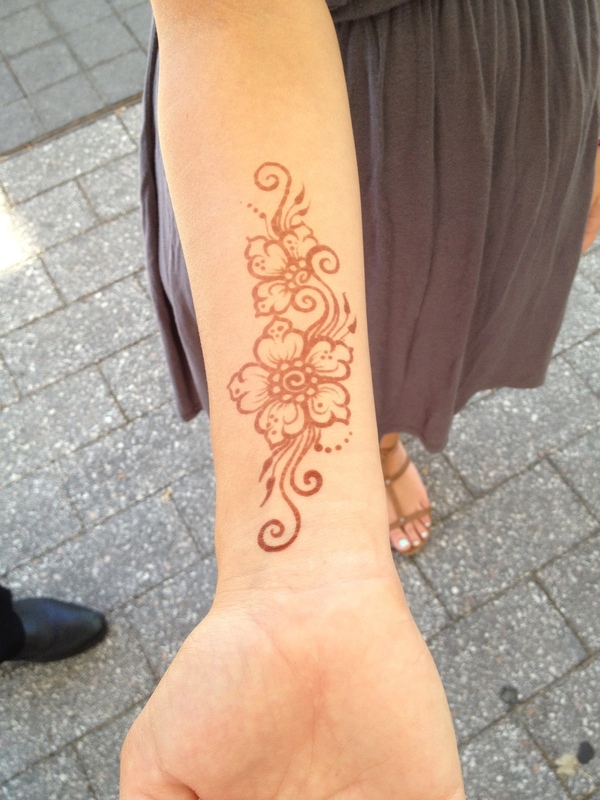 Make sure you are wearing clothing that will not interfere with the area where you are wanting your henna design. 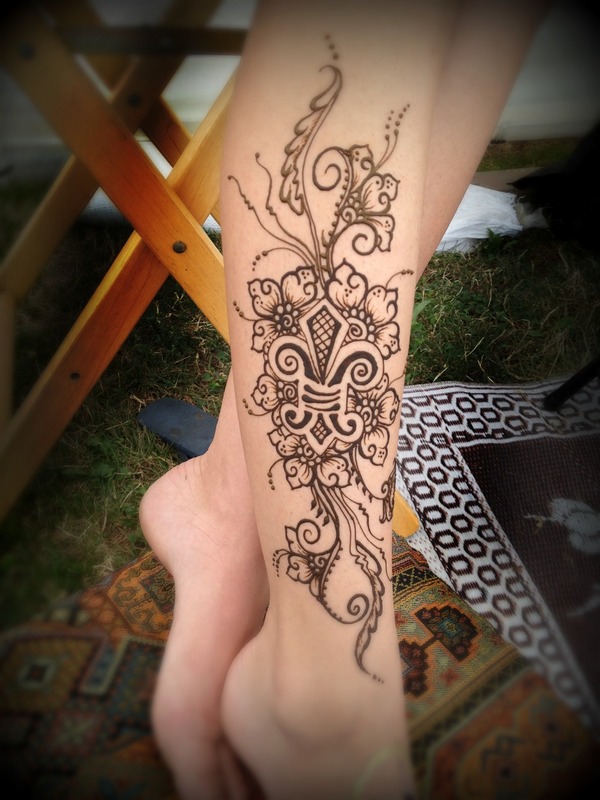 Henna works best on areas that are not excessively hairy, so keep that in mind when choosing a location for your design. 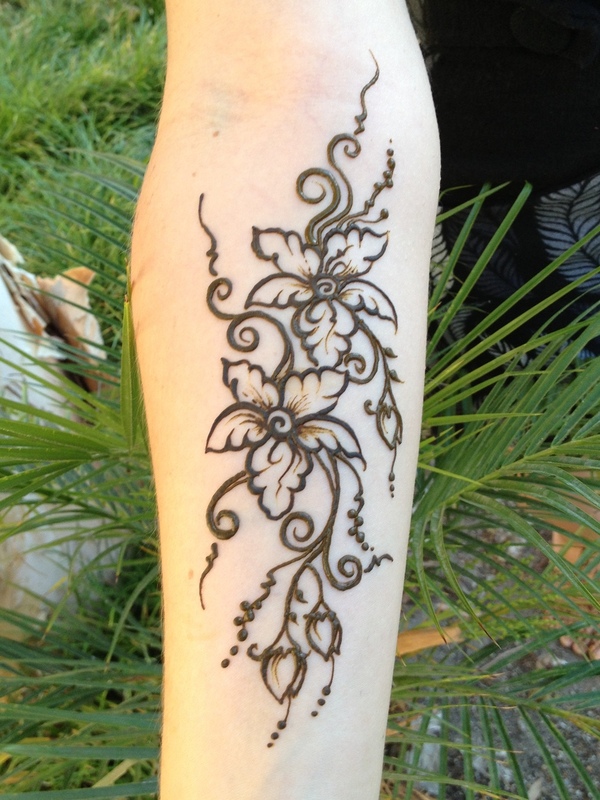 Application: Henna is applied as a paste and wherever that paste touches it leaves a stain on your skin. The paste is applied freehand with a cone, it looks like cake decorating! The paste can take from 15 to 30 minutes to dry depending on how thick the design is. But, even after it is dry it needs to remain on the skin for as long as possible. If it's warm out (summertime warm) then 4 hours is a good amount of time, if it's cool out and your body is cool you'll need to leave the paste on for as close to 8 hours as possible. During that 4 to 8 hours that the paste is on the skin you cannot dislodge the paste, so you should keep the moving of that area to a minimum and don't allow it to get bumped or touched by clothing. You may have heard of people putting a lemon/sugar solution on top of their henna, I put lemon and sugar INTO my henna paste in order to keep it pliable and sticky so that it will stick to your skin, so a sticky, goopy sealant is not necessary. When the paste first comes off the resulting stain will be a light orange and will then oxidize over the next 24 to 36 hours into a reddish-brown stain. The color of the stain can be different shades depending on a multitude of variables. The hands and feet stain the darkest because they have the most layers of skin, as you move away from these areas the skin becomes thinner and the stain is therefore lighter. Pregnant bellies get a fairly light stain, but because of the warmth of that skin they tend to stain a little darker than non-pregnant bellies! Dryer skin soaks up henna stain better than oily, but dry skin also exfoliates faster, so it may be darker but may not stay as long. Pale skin will have a higher contrast to the henna stain, but dark skin tends to get a darker, more mahogany colored stain. 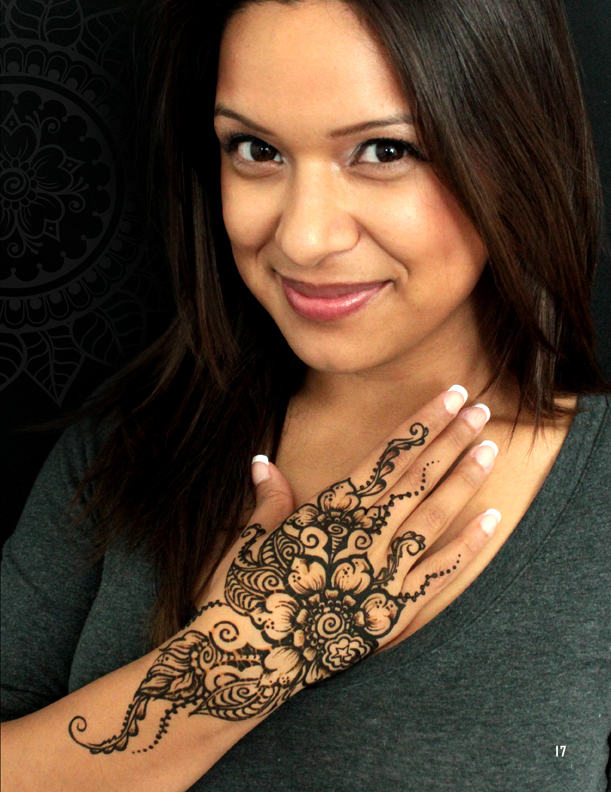 Henna comes from parts of the world where the people have dark skin, it does show on dark skin! 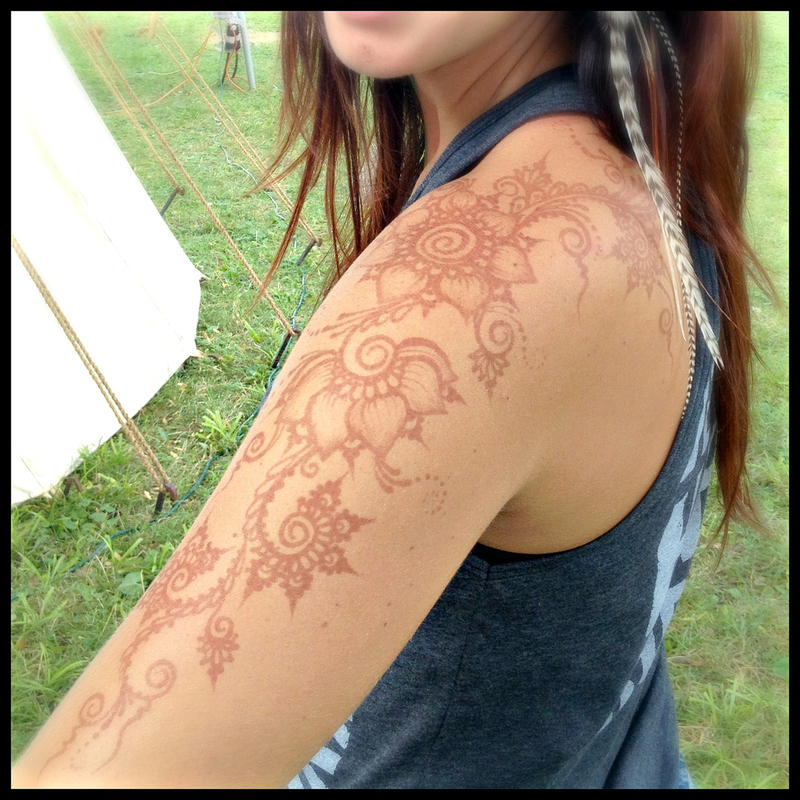 Henna will last anywhere from 7 days to 3 weeks. The stain is actually permanent, but it's on the layers of skin that will exfoliate off, so anything you can do to keep your skin on will keep your design on too! 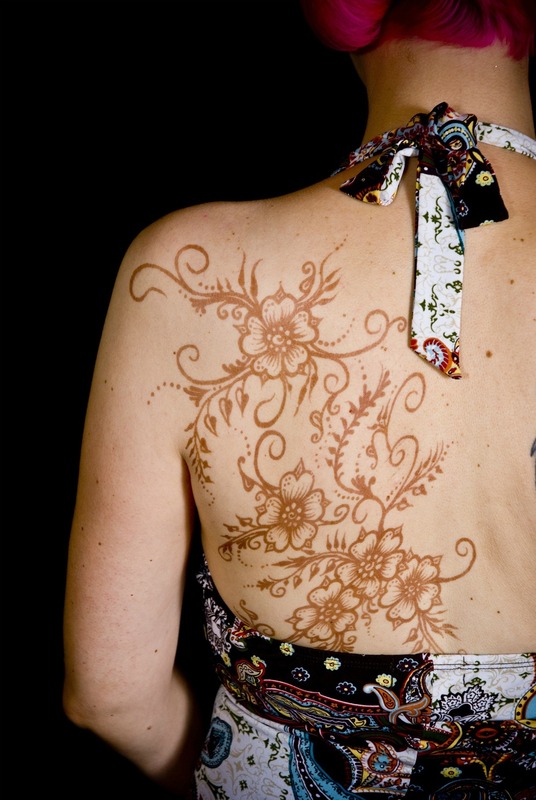 I will not henna lower backs or necks because these areas move too much and it is nearly impossible to keep these areas from stretching, the paste from smudging, or to keep it undisturbed for the amount of time needed for good staining to occur. 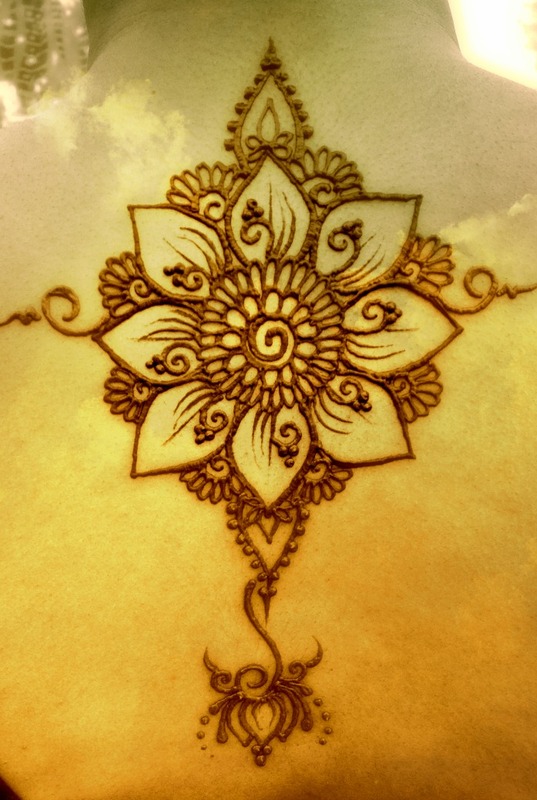 Aftercare: To get the best, darkest stain and the longest life out of your henna design you need to leave the paste on for as close to 8 hours as possible. Keep it warm and yourself warm while the paste is on. Drink hot tea, keep in a warm place. When it's time to remove your paste scratch it off into the garbage, sink, or toilet, but do NOT WASH it off. If there are some stubborn bits of henna that you cannot scratch off, use a little lemon juice or olive oil on a cotton ball to remove it. While the color is oxidizing from orange to brown over the next day or two its best to keep your henna design out of water. If you MUST get it wet, first cover your design with a body butter, or some lotion containing shea butter or cocoa butter..... even a natural chap stick like Burt's Bees will work or a little shmear of olive oil. After your stain is matured keep your skin moisturized and do not scrub that area. Excessive rubbing from clothing or shoe straps will speed up exfoliation and therefore the demise of your henna.